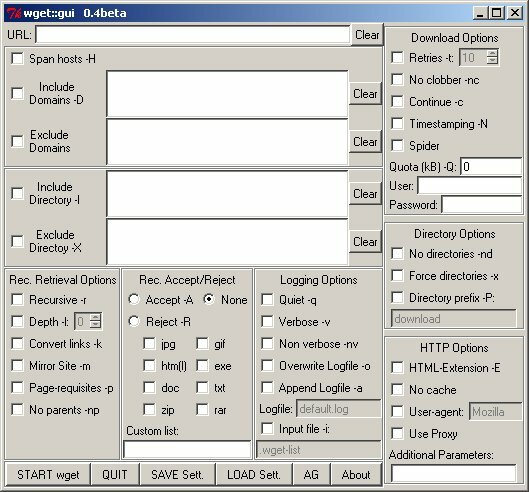 Wget::gui is a graphical user Interface (GUI) for the command-line operated webgrabber wget. It is written in Perl, with usage of the Perl-TK-Modules. Wget::gui runs on Linux and Windoze. It handles not every option of wget, but some of the mainly used options. Read the manual of wget to get more information. You can save all active options to a settingfile (wgetguirc). Includes a generator for URLs with serial numbers. Refer to the documentation of your distribution. Windoze don't accept the Linux-filename. So I renamed wget::gui to wget__gui. Unzip the downloadfile to any directory. Make sure that all required programs are installed. Make sure that wget is in your current PATH. You can check your option-setting in wget::gui by clicking the button "Start wget" without given URL. In the backgroundwindow you see the start-command for wget. The active options are stored to "wgetguirc" by clicking "Save Settings". 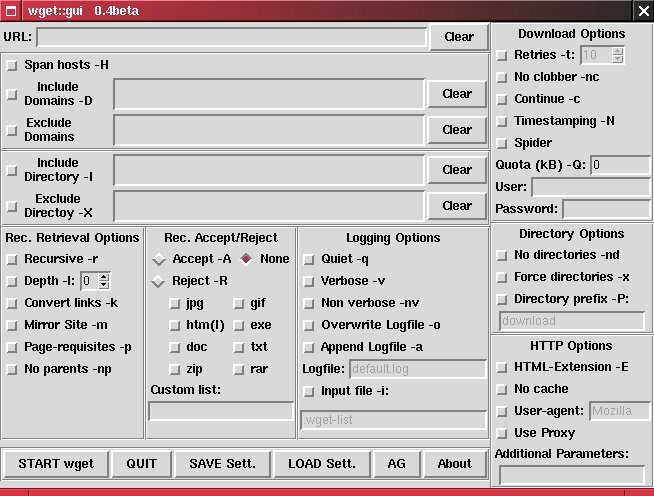 But I don't find a similar GUI for Linux. Gwget has far to less options. So I started my own project in writing a GUI for Linux, using the language Perl and the TK-Modules for Perl. Although the program is written for Linux, you can use it in Windoze with ActivePerl. I arranged the options similar to the Wget-Manual. You can refer to that documentation for further informations. I don't include a documentation for wget::gui. Some additional features are: user/password, include/exclude directories, input-file. I don't use any shellscripts. You can use the input-file for multiple downloads.